Featured: Jurassic Park: Aftermath – returns! Trespasser Beta 96 isn’t a build from 1996. It’s actually the 96th compiled build of Trespasser. The final version is build 116 and the version 1.1 patch is 117. However, there are enough differences in beta 96 to make it worth checking out. Including a completely different model for Anne and many other things not found in the final version. Can You Link Me to a Download of the Beta? I don’t like playing the game in the beta engine. Can I use the final game instead? Yes you can. However, some objects may have issues appearing in the final version’s engine and ATX patch engine. These objects are mainly one with different vertices than the final game uses. 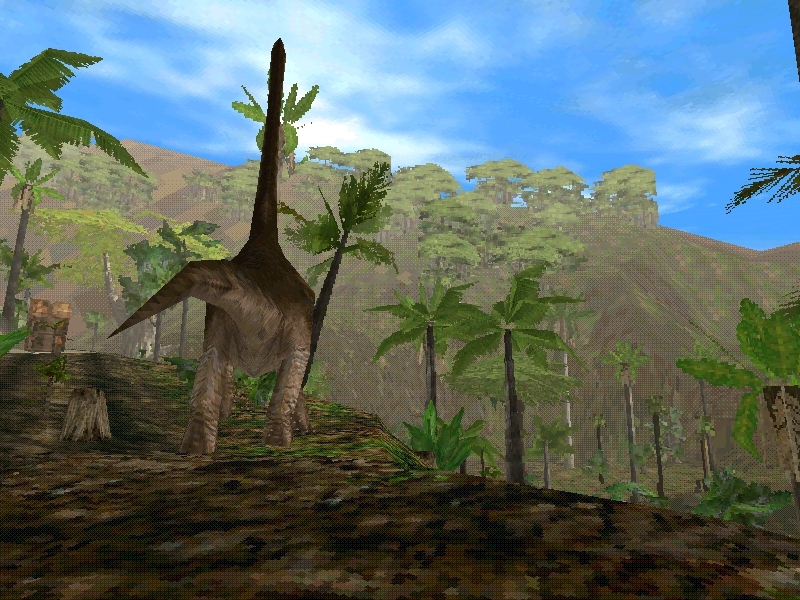 One example is the Parasaurolophus in the Town level. It uses a much older base model with difference vertices that the final version isn’t compatible with. As a result, the skeleton and collision boxes walk around without the skin on them making the dinosaur invisible in the final. This Para also can attack the player which makes it even more threatening. Fortunately, you can use the “BONES” cheat to locate the skeleton and collision boxes and see where it is. Also, the T-Rexes nearby will attack it causing blood to fly as well. Good indication of where it is. Another thing you will need to do is port over the beta’s TPAs as it uses several ones missing or replaced in the final version’s .TPA file. The beta engine is crashing in software mode! What’s wrong? It seems the beta engine is highly unstable in software mode. I think I tested this once. It seems Software mode crashes after a certain amount of time without warning using the Beta’s EXE. Primary Display mode is more stable and crashes less. Try that if Software is constantly crashing on you. Just keep in mind that depending upon your computer primary display mode may cause choppiness in the game. Laptops especially have this problem in this day in age. Most desktops are fast enough to Run Trespasser at full speed in Primary display mode, or at least close to it anyway. If all else fails, use the final version’s EXE instead. Note added by TresCom: Remember that modern computers is not supported by Trespasser, even more likely that they are unsupported by beta 96. If you try to play the game on an older computer, you might experience less crashes. We have had reports that some people experience a lot of crashes, while some don’t experience many or even none, it all depends on your computer. What is this “Stegoland” you refer to many times in your articles? Stegoland refers to a massive bug in beta 96 that tends to teleport objects across the map for no reason, often teleporting them out of bounds. This bug can even teleport the player out of bounds as well, usually killing them. The bug got its name due to it first being encountered happening to a Stegosaurus in Jungle Road by Draconisaurus and Mickey. I was there too but didn’t really give a crap about “Stegoland” at the time. The Stegosaurus was teleported to some random spot out of bounds. However, Stegosaurus isn’t the only object or animal affected by this. In fact, it can happen to anyone or anything. It should also be noted the bug may not always teleport out of bounds. Sometimes it may teleport the object a few feet away from where it was previously. It can also occasionally teleport two objects out of bounds at once. One time, I was fighting a Raptor and we both were teleported out of bounds for no reason and still fighting. I’ll try to note specific places and objects known to cause this glitch in my articles. However, be aware that there may be more than I know about. What Cheats work and what ones don’t in the beta engine? All other cheats present in the final either crash the game or don’t work at all. It should be noted that unlike the final version, INVUL actually works properly. In the final, it has a bad habit of not working when entered.